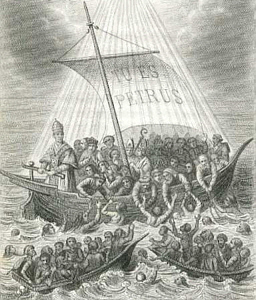 In Today's Catholic World carries the approbation in writing of the (True) Petrine Hierarchy in exile i.e., connected with Pope Gregory XVII. It faithfully adheres to the rules for Catholic Journals mandated by Leo XIII in the Apostolic Constitution Officiorum ac Munerum, Jan 25, 1897 - so heavily re-stressed by Pius X in Pascendi Dominici Gregis, Sept 8, 1907. 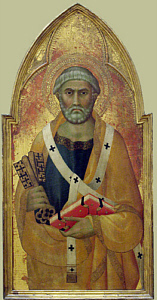 St. Ignatius of Antioch - "Let no one do anything of concern to the Church without the bishop. Let that be considered a valid Eucharist which is celebrated by the bishop or by one whom he ordains [i.e., a presbyter]. Wherever the bishop appears, let the people be there; just as wherever Jesus Christ is, there is the Catholic Church." "...the doorkeeper of the of the heavenly kingdom." 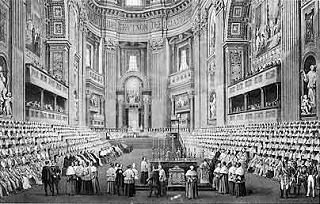 The Vatican Council 1869-1870 A.D.
blessed Peter in this primacy: let him be anathema." On The Permanence of the Primacy of Blessed Peter in the Roman Pontiff -July 18th, 1870 A.D.
of the Keys of the heavenly kingdom may not reject them as having deviated from his doctrines." "This is the time of the power of darkness, but we must challenge that darkness! devotion to the Papacy. 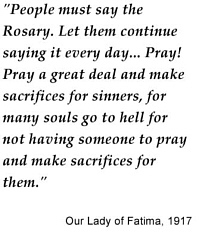 Yet, it is a requirement of a true Catholic. You must have all three. "Hold on by the sure and firm anchor of the Catholic Church..."
(Includes video exposing Sanborn, Dolan, Cekada's fellow *promoter of the so called "Sedevacantist (FALSE) Thesis"
St. Cyprian: "There is one God, and one Christ, and there is one Church, and one Chair founded by the voice of the Lord upon a Rock. Another altar cannot be constituted or a new priesthood be made, beside the one altar and the one priesthood. Whosoever gathereth elswhere, scattereth. Whatsoever by human madness is instituted, so that the divine disposition is violated, is adulterous, is impious, is sacrilegious" (Epist. ad Pleb. xl. n. 5). 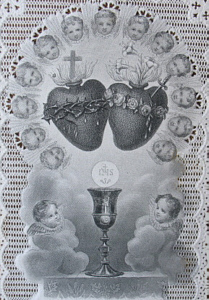 in the singular, "The Holy Heart of Jesus and Mary," urging that they were morally one. “I make an urgent appeal to the earth. I call on the true disciples of the living God who reigns in Heaven; I call on the true followers of Christ made man, the only true Saviour of men; I call on my children, the true faithful, those who have given themselves to me so that I may lead them to my divine Son, those whom I carry in my arms, so to speak, those who have lived on my spirit. Finally, I call on the Apostles of the Last Days, the faithful disciples of Jesus Christ who have lived in scorn for the world and for themselves, in poverty and in humility, in scorn and in silence, in prayer and in mortification, in chastity and in union with God, in suffering and unknown to the world. It is time they came out and filled the world with light. Go and reveal yourselves to be my cherished children. I am at your side and within you, provided that your faith is the light which shines upon you in these unhappy days. May your zeal make you famished for the glory and the honour of Jesus Christ. Fight, children of light, you, the few who can see. For now is the time of all times, the end of all ends." © StGemma.com Web Productions Inc. 2005-2019. All rights reserved.